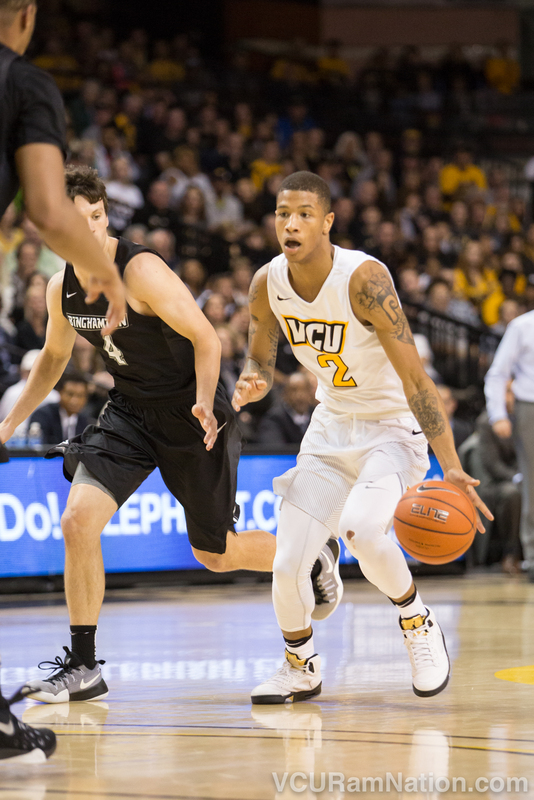 Redshirt freshman Samir Doughty finished with a career-high 12 points in VCU’s win over LSU. VCU picked up their second win in two days, using a big half to comfortably distance themselves from the LSU Tigers, cruising to an 85-74 win. The Rams took a seven-point lead into the locker room then came up hot in the second half, extending their advantage to as many as 19 points before coasting to victory. VCU shot 49% in the win but turned 14 steals and 18 LSU turnovers into 19 points for the black and gold. Three Rams had three steals each including leading scorer JeQuan Lewis who led all players with 19 points to go with a season-high nine assists and five rebounds. Lewis just outpaced junior forward Justin Tillman in the scoring column. Tillman posted a season-high 17 points on 8-9 shooting and added a game-high eight rebounds for the Rams. Redshirt freshman Samir Doughty added seven rebounds of his own to go with a career-high 12 points, his third double-digit scorer performance over the first six games of his career. Nine Rams scored in total. The win moves VCU to 5-1 on the season and 2-1 in the Battle 4 Atlantis, VCU’s first non-conference tournament winning record since all the way back in 2001. The Rams lone loss of the tournament came to eventual Atlantis Champion Baylor (6-0). The black and gold led that game by eight at the half before seeing their lead evaporate late to relegate the Rams to the consolation bracket of this year’s event. VCU will return home to Richmond where they’ll have short prep for a talented Princeton team (2-2). The Rams will face the Tigers of the Ivy League Tuesday at the Siegel Center in a 7PM home tip that will also air on MASN.